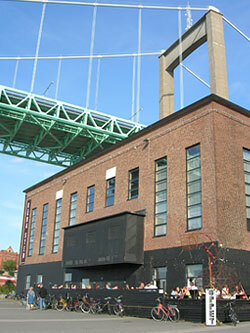 Röda Sten Konsthall (Art hall) is a culture house that is a non profit organization. The economy is financed among other from the municipality, government and admissions. Here you will find exhibitions, lectures and bands playing etc. You can also come here to eat and have a cop of coffee. The direction is contemporary art and they also exist to spread interest about other interesting culture expressions. Röda Sten Konsthall has four floors and their premises is perfect for a private party or a party / konference for your company. 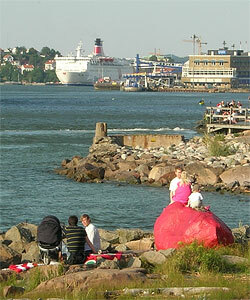 It´s a very nice area to walk around in and look out over Gothenburg harbour. 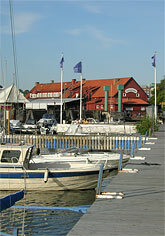 You will pass the restaurant Sjömagasinet, the Novotel Hotel and a small marina for boats. The building was built year 1940 at the same place were the Carnegie Works (manufacturing of suger and porter) was located at this time. The building was a heat central a "boiler room". Here they burned with coal and chips that were stored in big tanks hanging from the roof. 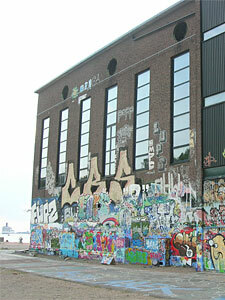 During the 80´s the building was totaly abandon and the todays youth were gathering to have parties and they also started to paint graffiti on the walls. You can see some grafitti at the back. 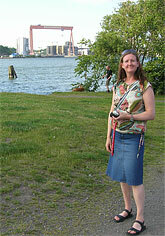 In the 90´s the culture project "Röda Sten" was founded. It was founded to preserve the old house and to use it for culture activity. Around Röda Sten there are remainings from the stone age and here you aslo find the remainings from the old fortress Älvsborg. When East Indiaman Götheborg sailed during the 1700´s the ship was moored and careened here. During the 1800´s when the Scotsmen arrived to Gothenburg they built a small society with a church and a school around the area were the company Carnegie was situated at this time. What´s the story about the redpainted stone. Is it any history connected to it? There are three tails about the stone and the stone is known since way back in 1758. The stone is located down by the river bank. - that a Swedish officer have been killed and that his blood was spread all over the stone. This shall have been during a Danish disambarking. - that a Ship was saved during a storm and it used the stoned to tie up the Ship. - the stone has only been a local sea mark to navigate with. 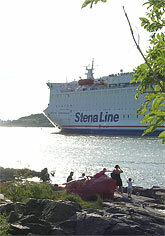 A lot of activities is taking place at Röda Sten from exhibits to festivals.